Britain and France have agreed on the principles of a deal that would end a dispute over scallop fishing in the English Channel. No UK vessels will fish for scallops in the Bay of Seine during the period when the French are not allowed to catch. A joint statement from the two governments said talks in London on Wednesday had been "constructive". But a finalised deal hinges on a "reasonable compensation package" for smaller British boats, which lose out. Around 40 French boats clashed with five UK crafts off the coast of northern France last week. Talks were held between representatives of the UK and French fishing industries and Defra officials on Wednesday in an attempt to resolve tensions. 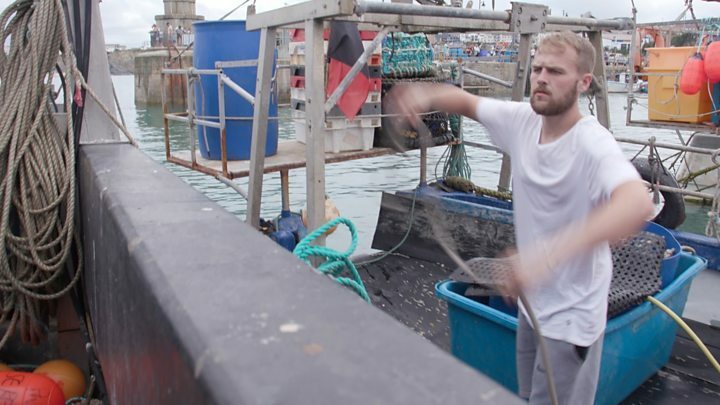 Scallop wars: Could Brexit calm troubled waters? Reality Check: What are the rules on scallops? Regulations allow British boats to fish in the Bay of Seine, a scallop-rich area off the Normandy coast, all year round. But French fishermen are banned from taking scallops from the area between May 15 and October 1 to conserve stocks. A previous industry agreement prevented UK vessels larger than 15 metres from fishing for scallops in the area during that period too, but smaller boats were free to do so. The deal agreed in principle on Wednesday would prevent smaller boats from taking advantage of this window. Those vessels will be compensated for their losses, with the amount to be agreed at a meeting in Paris on Friday. Media captionScallop row: What's the EU's fishing feud about? But a UK industry representative involved in the talks said the deal would only be finalised if British fishermen did not lose out. Jim Portus, chief executive of the South Western Fish Producers Organisation, said: "I'm very pleased that we've negotiated a deal which satisfies the honour of fishermen on both sides. "The French are in a hurry to make sure that it happens because what they don't want either is another conflict. "Quite frankly, if it's not good enough on Friday, it will be rejected." He added he was "pleased" the French had expressed "regret" during the talks for the recent clashes. All British boats have been asked to voluntarily stop fishing for scallops in the conflict area until a deal is finalised. Speaking after the talks, French industry representative Pascal Coquet said it was a "good deal". The talks were held after French and British boats clashed off the coast of northern France last week, with UK crews reporting rocks, smoke bombs and other projectiles were hurled at them during the confrontation. The French boats gathered overnight on Monday last week in protest against so-called "pillaging" by five larger British vessels. The British were chased away and two boats, Golden Promise and Joanna C, returned to Brixham harbour with damaged windows. The British crews say they had been surrounded and had rocks and metal shackles thrown at them. French police said UK boats responded in kind. 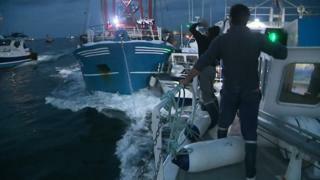 A video published by French media showed a Scottish scallop dredger, the Honeybourne 3, colliding with French vessels.